Tilly is the name of choice for Newport Aquarium’s Facebook fans. 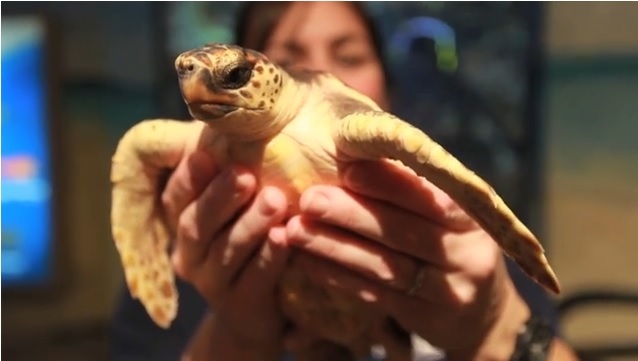 The people have spoken and Newport Aquarium‘s baby loggerhead sea turtle’s name is officially Tilly! After a week-long Facebook naming contest Tilly finished first ahead of Josie, followed by Emmy and Carolina. 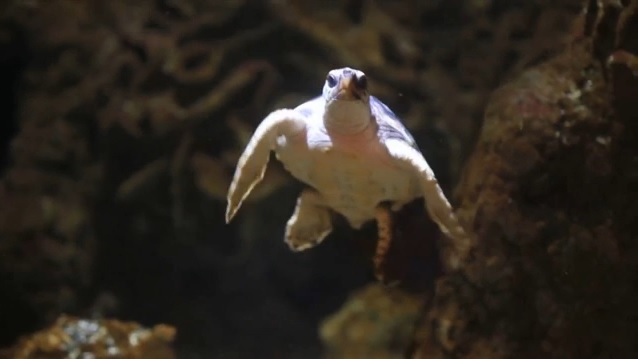 Tilly first made her public debut last Tuesday when she was formally moved to the Hanauma Bay tank at Shore Gallery during Newport Aquarium’s press conference announcing the upcoming Turtle Canyon exhibit. On Monday, Feb. 24, Tilly surpassed the 2-pound mark after weighing in at 929 grams (2.05 pounds to be exact). With her increased weight, her food intake has been moved up to 14 grams twice per day. Tilly is getting settled into her new digs and so has shown no trouble catching some ZZZZs. Tilly in the Hanauma Bay tank at the Shore Gallery exhibit. She has shown no hesitation in mixing and mingling with the other animals in the tank. Although Hazeres said the eels in the tank appear to be hiding since Tilly’s arrival. The biggest challenge Tilly has faced is competing for good. Hazeres uses a net to divide the fish in the tank from Tilly during Tilly’s feeding times. Eventually, Hazeres states, Tilly will need to learn to be fast with getting her food as it’s a trait she will need to know once she’s released back into the wild next fall. Visit Newport Aquarium’s official blog – aquariumworks.org – to read #TurtleTuesday updates. 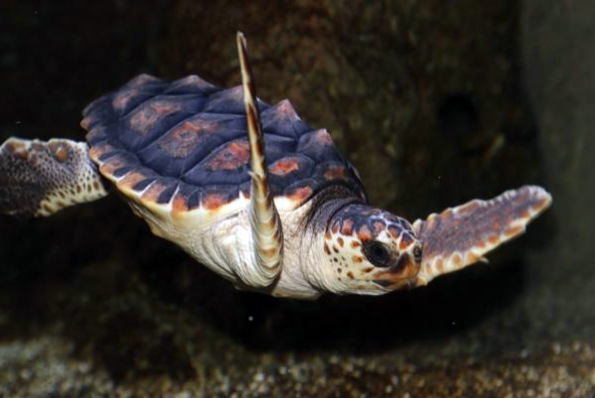 This entry was posted in Turtles, Uncategorized and tagged Loggerhead sea turtle, Sea Turtles, Tilly, Turtle Canyon, turtles by NewportAquarium. Bookmark the permalink. I am a turtle volunteer in the town of Emerald Isle, NC. Its great to see Tilly (or EMMY, as I’ll always think of her) has found such a great temporary home! “She” spent her first night out of the nest in a bucket at my house in Emerald Isle. I brought her to the NC Aquarium at Pine Knoll Shores when they opened the next morning. I love that I can follow her progress! Thanks so much. Like Sharon, above, I take a personal interest in Tilly/Emmy since he/she hatched from a nest in my sea turtle zone in Emerald Isle, NC. Her mother was an exceedingly large loggerhead who laid her clutch of eggs in a perfect location on the beach, well above the high tide line. It was morning (about 6AM) when she made her way back to the surf, so volunteers were able to actually see her. I was the lucky sea turtle protection volunteer who actually located the eggs to confirm the nest (to make sure it wasn’t a false crawl with no eggs). And then my husband and I “babysat” every night, along with Sharon and others, at hatching time to make sure no land predators interfered with the hatchlings’ trek to the surf. I’m looking forward to Emmy’s return to our area for her return to the sea and the Gulf Stream! I know you’ll take good care of her until that time.